1) Argentina: 10-1: How do you build a team around a player without being reliant on him? The tightrope that Jorge Sampaoli has to tread with Lionel Messi is made of a spider's silk but if he manages to strike the right balance this could be Argentina's time. It is 32 years since they won the World Cup, a barren run for a generation that has included some of football's great talents. Ángel di María and Paulo Dybala could do with stepping up to help Messi. If they do, Argentina will be among the contenders. No longer the shrewd punter's tip as dark horses, the Red Devils are now among the genuine challengers. They have the squad: probably the Premier League's best all-round player in Kevin De Bruyne; Dries Mertens, one of Serie A's top players; and then there is Thibaut Courtois, Jan Vertonghen, Eden Hazard and Romelu Lukaku. The concern must be Roberto Martínez trying to shoehorn his team into a 3-4-3 system without any real wing-backs. If all the moving parts click - they will be formidable. If only they had had this team four years ago. 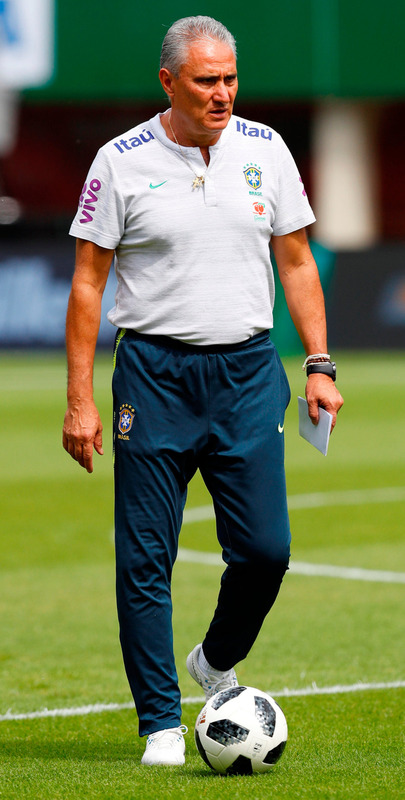 There is a refreshing verve to Tite's side and one that is not so reliant on a single player. With Philippe Coutinho, Gabriel Jesus and Roberto Firmino around there is less likely to be a national meltdown if Neymar is absent. They qualified in style and have lost once in 20 games under Tite. You could make a competitive team from those France left out of their squad, never mind the 23 heading to Russia. There are a few questions to consider: will Paul Pogba perform? Will the team get the most from Antoine Griezmann? Will Hugo Lloris cut out the errors he makes for Spurs? This is a talented group and their biggest obstacle to success is Didier Deschamps, a coach who has rarely convinced in the role. It is worth remembering that Germany's worst World Cup finish since 1938 is the last eight. Travelling with a squad that is somehow both reasonably youthful - with two outfield players over 30 - and pretty experienced, just two with caps in single figures (and one of those is the reserve goalkeeper). You could point to Manuel Neuer's fitness, the possibility that Joachim Löw has stayed for too long or some limp performances in friendlies, but that would be splitting hairs. Spain look more like themselves again. Julen Lopetegui's side qualified with a swagger and a new generation of talent is combining with the remaining favourites of the old. The only position you can fault is centre forward: Diego Costa scored seven goals in a fractured domestic season and has struggled at international level. You might wonder how a team similar to the one that failed before can succeed now - but there's enough difference to think Spain can return to glory.